← Doing Charity Works can get you ahead in Business. Marketing is an essential element of a successful business. Its primary roles are building customer relationships and creating product awareness. Without an effective marketing strategy or plan, there is an immense possibility that you will lose customers which would eventually lead to revenue loss and bankruptcy. Marketing is needed for a company to succeed and grow. It is an action that you implement to put your products or services to your customers’ hands. A good marketing plan would also give you an opportunity to reach your potential consumers. You may already have a great product or service but yet don’t know how to get the attention of your potential customers. You have tried almost all possible marketing media channels to reach them such as the Television, Radio, Magazines, Newspapers, and even the Internet but you feel that it’s not enough. What can you do next? How do you go on from here? ICE H2O – A revolutionary marketing concept! Some companies spend a considerable amount of money for the marketing aspect of their business while others prefer the more creative and cost efficient way. The question is, is there a low cost marketing investment option available for you that guarantee to seek out and reach your potential customers? Introducing, ICE H2O – a revolutionary marketing conduit, which brings advertising and bottled water together for the first time. Advertisers place print ads on bottled water labels, using traditional print or QR Code technology, known as “TV on a Bottle. Consumers hydrate with ICE H2O’s high-quality bottled water, taking an average of thirty minutes to consume each bottle, according to research. In those thirty minutes, the advertisement on the label is seen eleven times more than average print ads. A percentage of advertising dollars is returned to the community, based on charities selected by advertisers and consumers. For roughly the same cost of a postage stamp, your advertising can be delivered on a bottle of water, reaching your consumers in a matter of weeks, with a percent of proceeds going to charity. 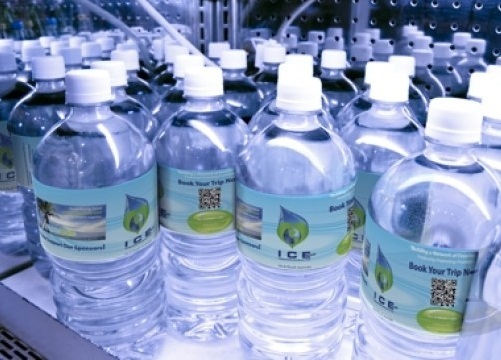 For an estimate cost and more information, contact us at 800-939-1423 or visit www.drinkiceh2o.com. This entry was posted in Advertising Adventures and tagged marketing media channel, marketing strategy, revolutionary marketing approach, revolutionary marketing concept. Bookmark the permalink.